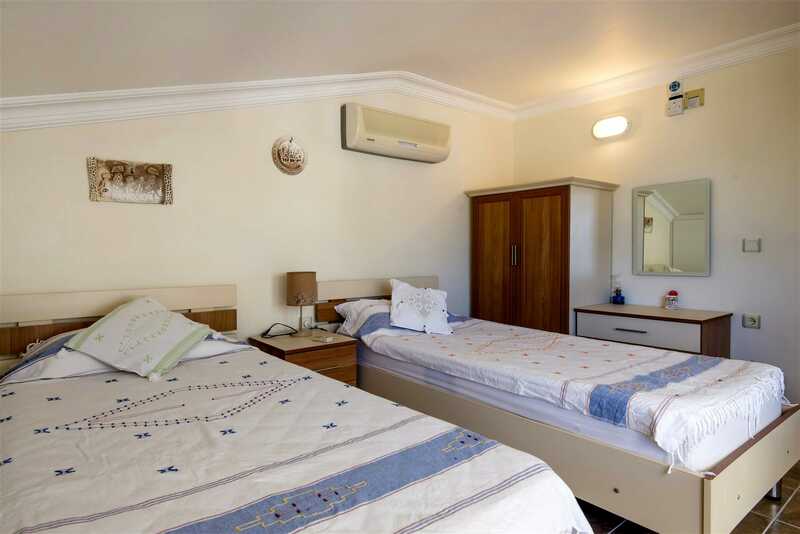 Villa Kirmizi Lale holiday villa in Kalkan Turkey - Truffle Properties. 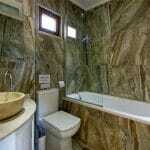 Villa Kirmizi Lale is a 4 bedroomed villa, which sleeps up to 10 guests. 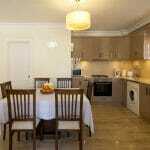 It is in a great location only 5 minutes to the nearest shops and restaurants and 10 minutes to the Old Town, beach and harbour. 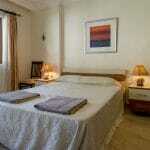 The villa has been extensively refurbished over the last 2 winters. 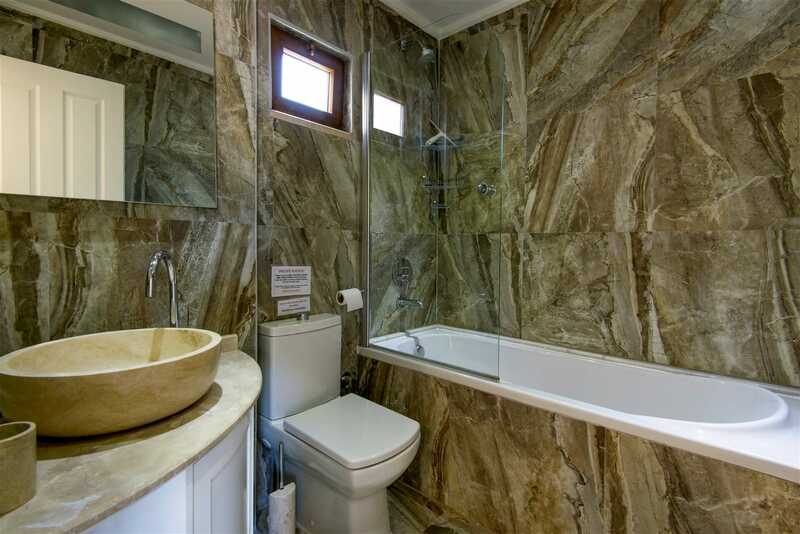 It has sea views from the first and second floor bedrooms and the roof terrace. 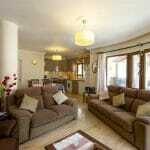 The villa has air conditioning throughout and Wi-Fi internet access. 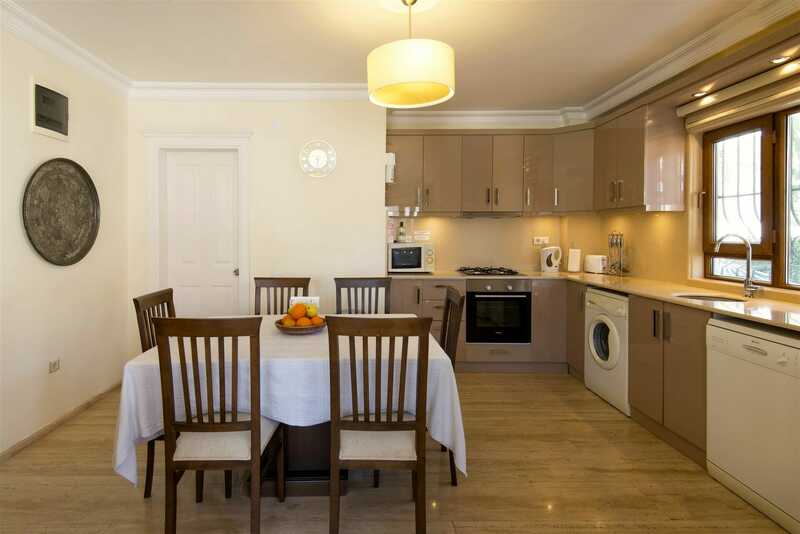 The entrance door leads into a spacious open plan lounge, dining area (seating for 8 guests) and kitchen. 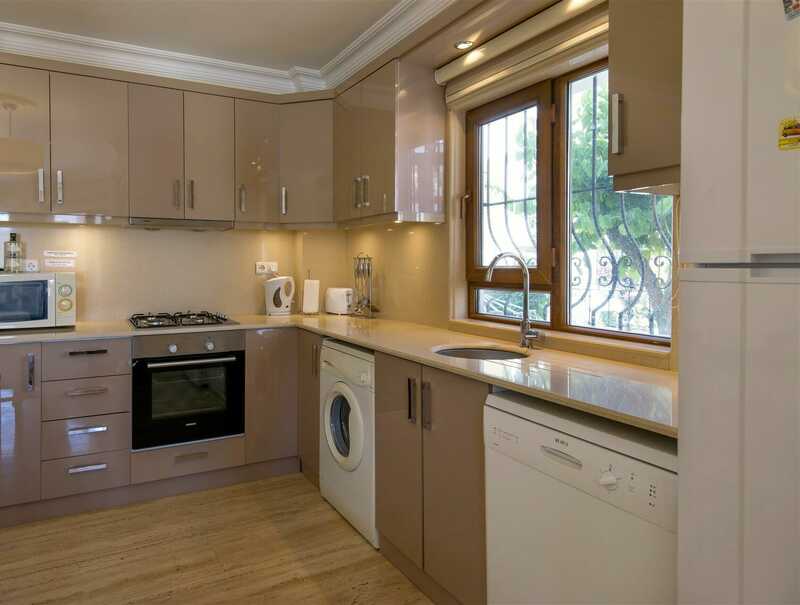 The contemporary kitchen is well equipped with a range of modern units and includes gas hob, electric oven, microwave, kettle, toaster, dishwasher, washing machine and large fridge/freezer. The lounge has ample seating, a wood burner, TV (UK terrestrial and free view channels), a DVD player, music system, iPod docking station and PlayStation 1. 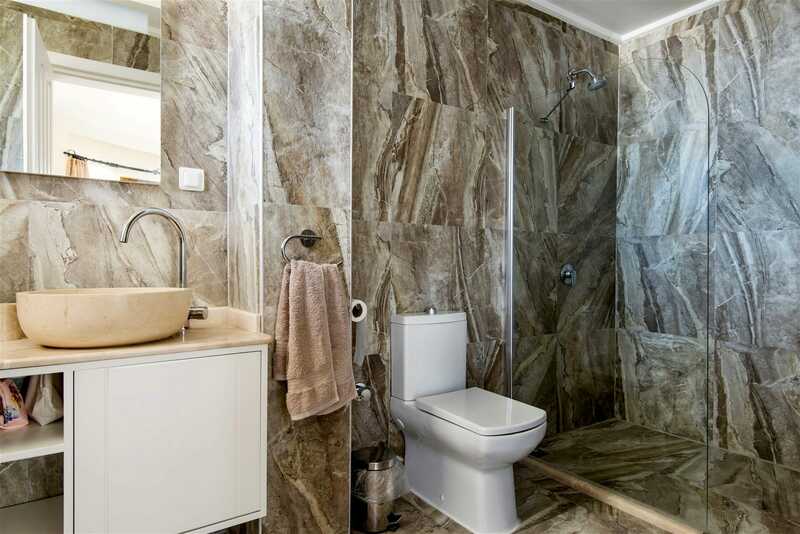 There is also a modern cloakroom with shower on the ground floor. 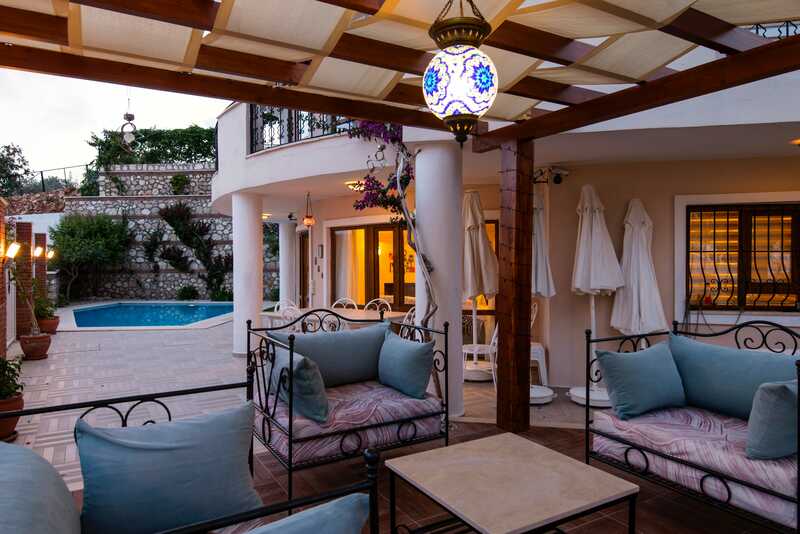 There are patio doors from the lounge area that lead directly to the newly refurbished pool terrace with a private swimming pool (approximately 7 x 5 metres with a depth of 1.75 metres). 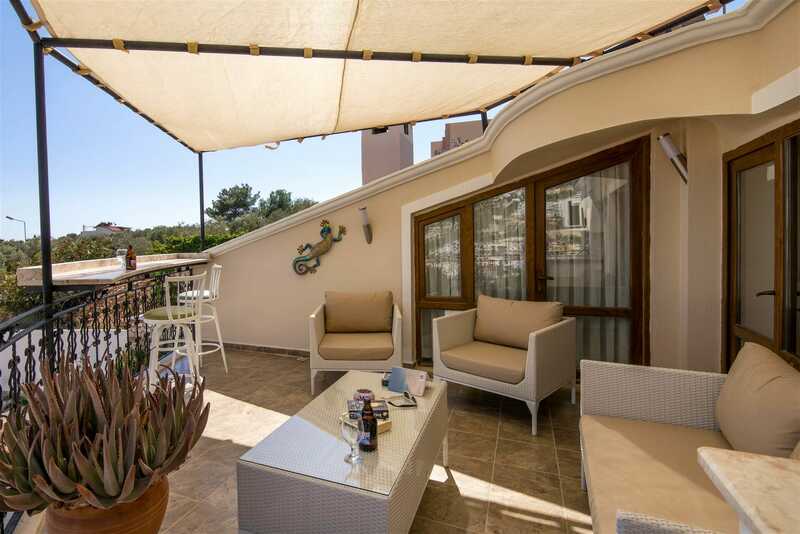 This spacious outside area has it all; sun loungers, parasols, raised pergola area with comfortable seating and table and chairs for al-fresco dining. There is a small portable BBQ and a larger fitted BBQ. If you are seeking complete relaxation, why not try one of the two hammocks in the garden! 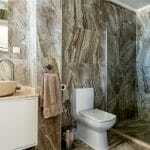 Master Bedroom – King sized bed, en-suite bathroom with his and hers wash basins and a large walk-in shower. 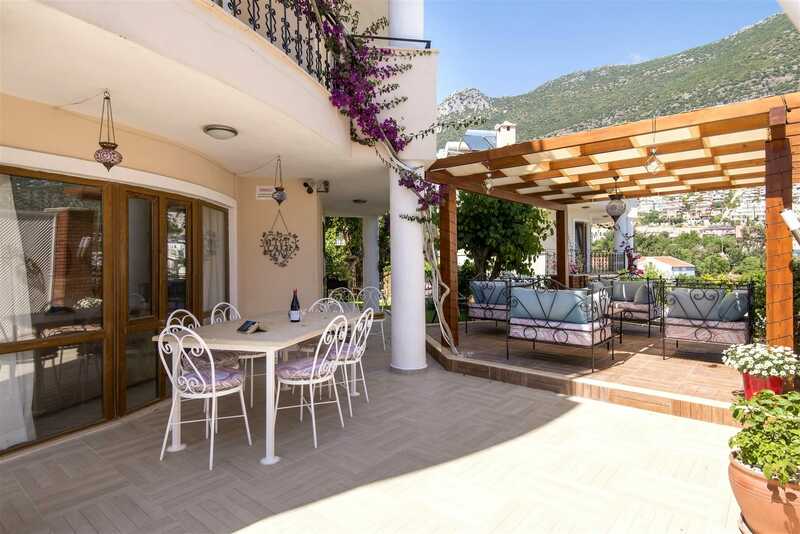 There is direct access to a balcony, with views of Kalkan and the bay. 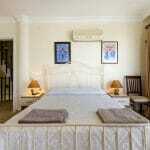 Bedroom 2 – King sized bed, en-suite bathroom with a shower over a full sized bath. There is direct access to a balcony. 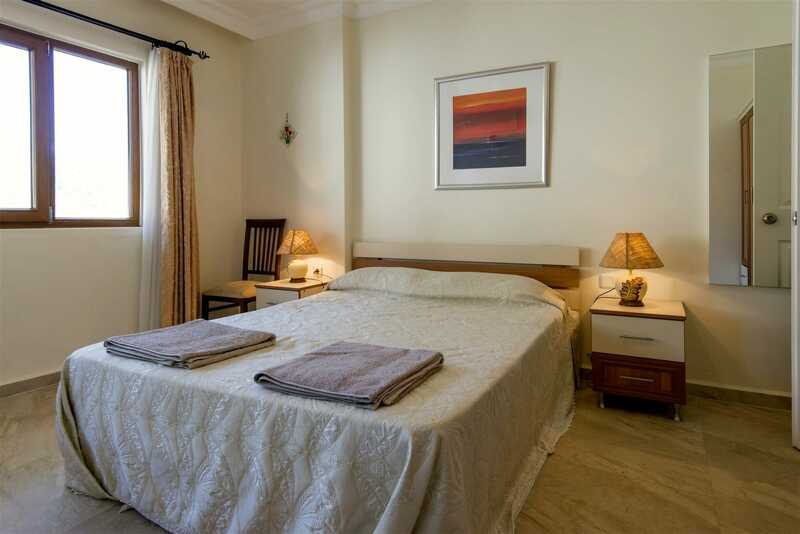 Bedroom 3 – King sized bed and twin single beds, with direct access to the roof terrace. 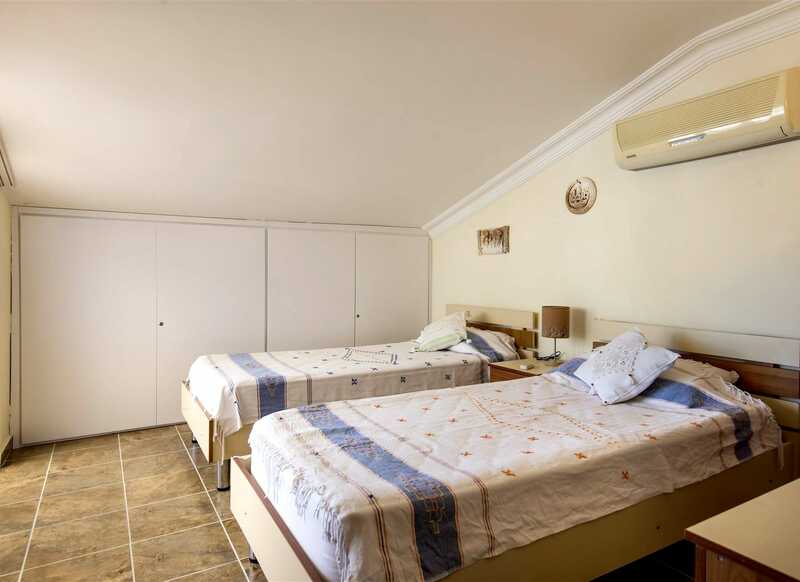 Bedroom 4 – Twin single beds with a view of the roof terrace. 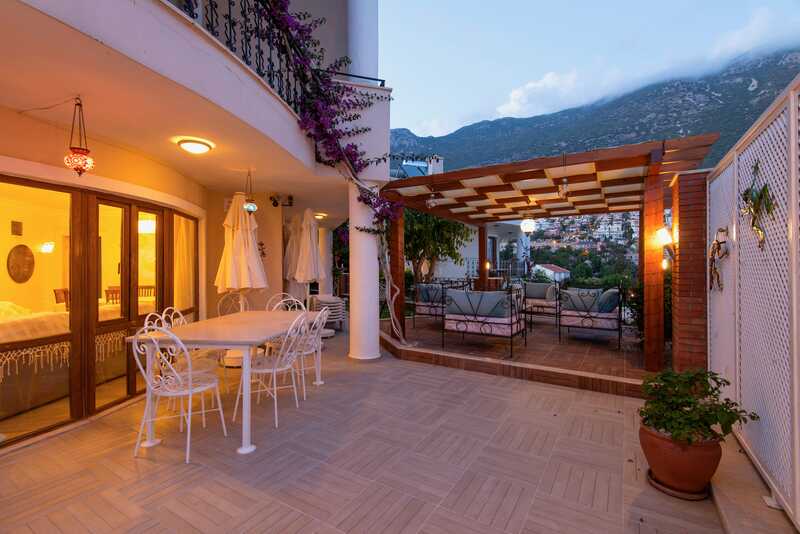 The newly refurbished roof terrace has amazing views of Kalkan and the bay. There is a marble bar with bar stools, the perfect spot for a sundowner. 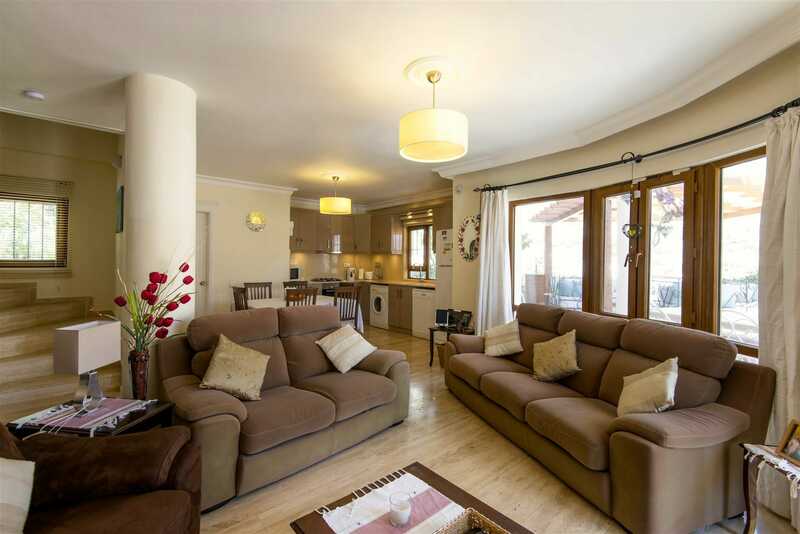 The shaded Ottoman area has comfortable modern seating and the kitchenette has a fridge, to keep those drinks chilled! 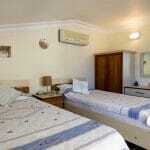 All linen and towels are provided, including beach towels. A Welcome pack is provided on arrival. 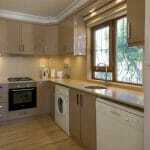 Cots, high chairs and stair gates are available on request, for an extra charge. 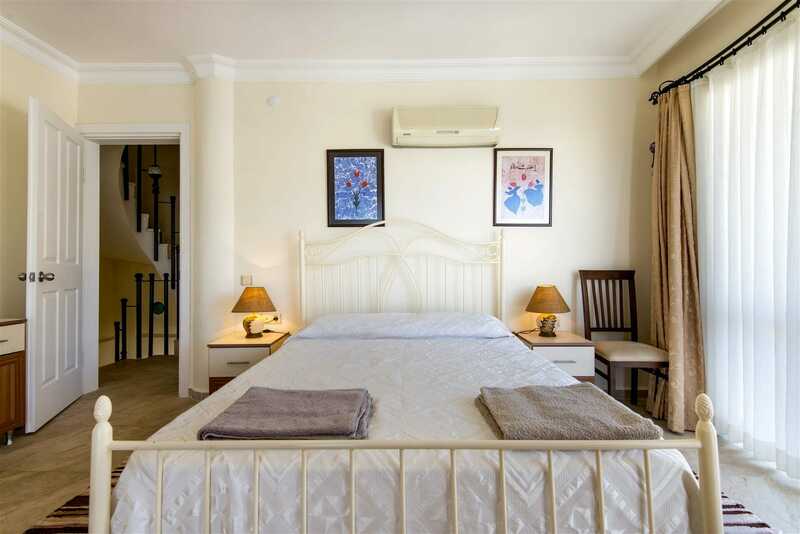 For new bookings for the months of May and early June 2019, made before 31 May 2019, a spring sale discount of up to 50%, will be offered.